From collecting food for local pantries to donating toys, the Vista community embraced the Spirit of Giving this holiday season by seeking out and creating opportunities to give back. AREAWIDE — Eric Stuebner is among the many Vista members who were inspired to give back, donating several food items to the Westbook branch of Shoreline Soup Kitchens & Pantries, Inc. – a nonprofit that operates several food pantries and meal sites scattered along the Connecticut shoreline. “It’s the right thing to do to help people in need,” said Eric, a Westbrook resident. 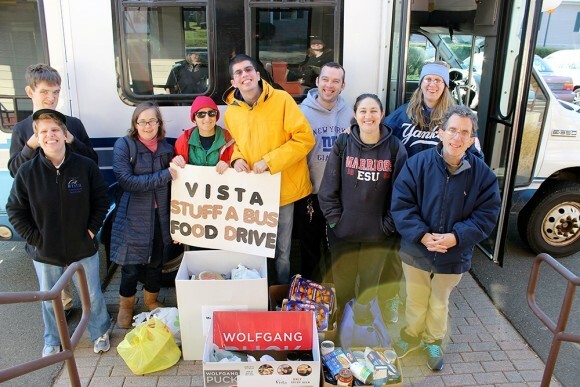 For the Thanksgiving holiday, a group of Vista members organized a “Stuff-a-Bus” food drive for the Madison Food Pantry. Thanks to the contributions of students, members, staff and community members, a total of 272 pounds of food was donated. Vista member Lauren Borges used her culinary skills as a way to give back to local first responders. To show her appreciation for their dedicated service, Lauren baked vegan dark chocolate chip cookies for the Clinton police and fire departments— which she hand delivered. Perhaps the most popular way Vista members chose to give back was by donating toys. In hopes of making the holidays more cheerful for children in need, members Chris Bailey, Leslie Strasser, Linay Dibble, Julie Butler, Alex Drago and Matt Sarti donated toys to the Toys for Tots program. Several more members opted to make a difference by donating articles of clothing. Member Sue Miller donated new gloves and winter hats to the “Mitten Tree” at Technique Printers in Clinton, which distributes donations to numerous local charities. Clinton housemates Matt Christiaanse, Laurie Seagull, Kirsten Hadad, Andrew Hart and Evan Brookman organized their own clothing drive to benefit Westbrook Youth & Family Services. Vista students, members and staff are always proud to support the communities where they live and work, and the Spirit of Giving is especially important during the holidays. Based in Madison and Westbrook, CT, Vista Vocational & Life Skills Center is a 501C3 nonprofit organization. Vista’s mission is to provide services and resources to assist individuals with disabilities achieve personal success.